Explores the technology that astronauts use, from space suits to Soyuz spacecraft, and scientific experiments on the International Space Station, and includes internet links to recommended websites to find out more. With a personal message by the British European Space Agency astronaut, Tim Peake, who spent six months on the International Space Station in 2016, and exclusive insights from the UK Space Agency and ESA who have provided expert advice on this book. A superb book all about how to become an astronaut... There’s a lot of humour in it, and it’s full of those little details that just make a book special. An engaging read which will reward repeated reading and enkindle awe for man's greatest achievement, reaching for the stars. The essential book for would-be astronauts. With a forward by the British Astronaut, Tim Peake this is perfect for little stargazers... Inspirational and entertaining. For those dreaming of the stars above our heads, then The Official Astronaut’s Handbook will make them seem that bit closer. This is the essential book for would-be astronauts, telling you everything you need to know about how to become an astronaut, and what it’s like to live and work in space. A great non-fiction book, full of information for all space lovers. The children found it fun to read as well as educational due to the illustrations and funny comments. It would certainly appeal and inspire children. This is utterly essential reading for any would-be astronaut, featuring tons and tons of facts and figures all about space and the people who work, explore and experiment there. This brilliant guide will tell you everything you need to know about becoming an astronaut and explains what life is like for space explorers. From training tips to spacewalk hints, it’s packed with real-life astronaut knowledge! Full of tips from real-life astronauts on how to steer a rocket or spacewalk. A perfect fact book for budding space explorers. 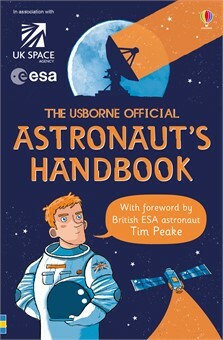 Children who fancy a career as an astronaut... will love The Usborne Official Astronaut’s Handbook, which gives you the lowdown on qualifications, the horrors of G-force and how to go to the loo in the International Space Station (into a kind of vacuum cleaner, apparently). It’s full of good practical stuff. This book should go to the top of any must-have list for young children interested in space travel. It’s packed with fascinating information on everything from what to study to help you become an astronaut, to the special training astronauts undergo, rocket science and how shuttles get into space, and what it’s like to live on the International Space Station. After all, the children reading this book could become fully fledged astronauts in the 2030s. Inspiring stuff!